Turkey done. Served. Delicious. This place is starting to resemble the vision we envisioned. A mid-century modern gem in Indianapolis ideal for socializing and otherwise enjoying life. No hesitations – pictures straight away. Storytelling for those interested further below. Kitchen and dining room were separate spaces divided by wall. Eight weeks gone. Crux traversed. Finally starting to focus on some finishing touches including lighting. Paid tribute to Eichler. Installed twin pendant lights. Eventually ceiling will be tongue and groove. At Rabb & Howe's workshop watching countertop fabrication. Heroically delivered on time. Pre-install dry fit. Quick shout out to Chimay and Kyle & Dara for some inspiration. Countertop waterfalls to floor on both sides with 12" overhang forming breakfast bar. First pot of boiling water. It begins. Note: morning light pours in through two large front windows on left, making this bar the perfect place for Sunday morning omelets. 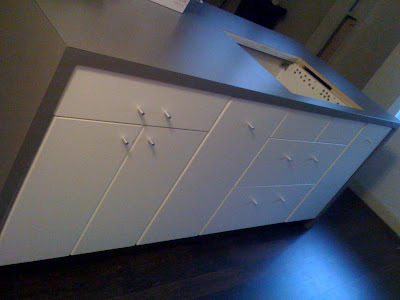 Sink wall with horizontal cabinets, staggered lines for design detail. Outlet detail. Once backsplash is installed outlet will be completely flush with surface. Snuck away for couple hours of work. Like day-job work. Thankful for a great gig. Doing what you love beats working for a living. Thankful for inspiration of other's work contained in AR's pages. Everything is looking great! We hosted our first Thanksgiving as well. But my pics are not up yet - big surprise. Congrats on the kitchen! I just chanced upon your blog today, it's great. We bought a MCM home a few months ago and are getting ready to do some remodeling. I always like to read about what others have done so your site is a help. I've started a blog on our remodel too but we haven't done much yet! No offense taken. Mostly. Comments questioning the authentic nature of our renovation are well within bounds. We had a plan to go about this one of two ways. 1. Find an MCM home with mostly original fixtures intact and "restore". 2. Find an MCM home virtually stripped of all original fixtures and combine a balance of contemporary modern with mid-century modern. As a lover of all good design I am perfectly at peace with this. Stick with us as there are plans to pull in more natural materials. We're only 8 weeks in. The road yet is long. Now onto the tone with which you chose to communicate your feelings. Safely described as a little self-righteous, accusatory and borderline aggressive. Though one could argue keeping a blog is somewhat narcissistic, I always remain polite. In any regard I'd love to see pics of your completely authentic restoration. Would even enjoy featuring them here on Atomic Indy as an example of MCM purism. Well, you certainly handled that comment a lot better than I would have. I'll follow your example and bite my tongue... Mostly. In any case, we can totally relate to the path you guys have taken, too. If we had bought an MCM home that had everything intact and/or worth restoring, then we would have gone more the restoration route. But speaking for our place, anyway, we were not exactly remodeling the Kaufmann house or some other icon of the time period. These are modest tract homes designed to be lived in - not museums. There's nothing wrong with replacing 1960-era laminate counters with 2008 laminate. And there was nothing special or worth saving or emulating about our tiny bathrooms, post 80s remodel, or even the original, cheap 1960-era faucets that are still made today and can be bought at any Home Depot. As for Mr. or Ms. "Intheknow", I'm always amazed at what people feel at liberty to write anonymously vs. what they would write or say when they are accountable. In any case, the community that knows and cares about mid-century modern design is so small as it is, creating some sort of schism to compete about who's more orthodox benefits nobody. I'm glad to see you take the high road, and not get sucked into something. I love to visit completely authentic and restored mid-century homes. But I wouldn't necessarily want to live in one. A woman we know sold her Neutra-designed home to live in another MCM home by a lesser-known designer. Why? She was burdened by the responsibility. Whenever anythning broke, she couldn't just fix it because there were no parts and every architecture student within a 1000-mile radius felt like they had some sort of veto power or opinion about whatever she did (she also got tired of finding said architectural students in her bushes taking photos all the time). I, personally, love the style but want to take advantage of what we have today. I prefer my modern dishwasher, ovens, fridge, etc. If "in the know" wants to live in 1955, that's their business, but there's no reason to insist on others doing so. To emphasize the point, my wife's family owns a 19th century farmhouse in France that we visit frequently. 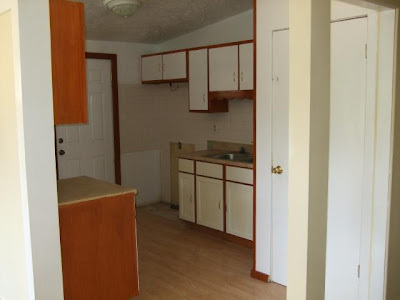 According to pictures I've seen of what it looked like originally, the kitchen was a dark, cramped room with no counters and only a small table, an icebox (i.e. a wooden box with a slot to place a block of ice), and a wood-burning stove. There we no sinks and no running water. There was no bathroom in the house, either. Needless to say, the place has been "updated" since then. Great blog! Thanks for the link1 Love the kitchen and the double globe lights! howdy... just beginning to click through the site. one question... with a combustion appliance (gas cooktop), does local code not require a hood? (want to make sure you're enjoying your home years from now)... we had the same dilemma and went electric to avoid the hassle and the extra hole in the roof. wow, the kitchen looks great! congrats! Good observation. From what I've been able to track down the code does not specify but rather defaults to manufacture's specifications. Our manual does not specify an exhaust fan vented to the outside. That said, we do have an exterior exhaust fan in the kitchen which is not functioning. It is a priority to get this fixed. Howdy from Cincinnati. Just browsing through your site. We've got the MCM Cincinnati show coming to town this weekend, and that always puts me in the mood. Even though I don't live in an MCM. And, for the record, I will also be re-finishing my kitchen in IKEA. It was gutted in the 70's, and nothing original remains. So I'm going to town...my way. Neat to see MCM in other parts of the country - I have an Eichler and I'm looking for bullet lights like yours - would you mind sharing where you found them? Thanks! Thanks for writing. 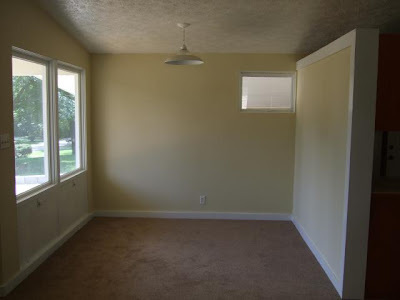 I'd love to see pics of your Eichler. The bullet lights in question were bought at a vintage salvage store here in Indy. Patience and diligence unless you're willing to spend. Thanks Baz - that is a great idea - I'll have to do some googling.. I love the Remcraft bullets, but they're a little pricey like you mentioned.